Despite the need to serve a range of patients spread over miles, rural healthcare organizations are providing shining examples of how health information technology can transform care. According to the American Hospital Association, only 3% of hospitals with fewer than 50 beds have fully implemented electronic health records (EHRs), and among the smallest hospitals (less than 25 beds), 55% have no EHR. 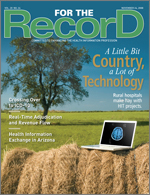 While smaller hospitals in general may not be able to match a large, urban facility’s resources, many forward-thinking rural healthcare organizations are stepping up to the plate and reshaping their missions to embrace technology. They are leveraging cutting-edge EHRs and other innovative health information technologies to deploy high-quality care to geographically dispersed communities—often so efficiently that they can serve as a model for urban facilities. In 2001, Citizens Memorial Healthcare in Bolivar, Mo., embarked on a mission to go completely paperless. The organization encompasses a 74-bed hospital, 16 physician offices, a home care agency, and five long-term care facilities. “Our strategic plan called for seamless care across the entire continuum,” says Chief Information Officer Denni McColm, “but as long as our medical records were on paper, that was impossible to achieve.” Lab results, radiology reports, and paper charts were often out of reach when physicians needed them most. Going completely electronic was the only way to provide access anytime, anywhere. Citizens Memorial’s MEDITECH electronic medical record (EMR) crosses hospital, home care, long-term care, and physician offices to enable the trending of vital statistics and lab results from visit to visit. All facilities use bar coding for medication administration, and a document management system from ImageNow scans paper documents into the system. But the question on everyone’s mind was, what happens when the network goes down or there is a power outage? The solution for Citizens Memorial was scripting technology. Consensus and buy-in is the first prerequisite for any organization planning to go paperless, says McColm. Everyone has to agree that it’s the right course of action and for the right reasons, such as anytime, anywhere access. When Citizens Memorial staff educates the public about the benefits of technology during open houses, the reception is invariably positive. This December, the organization’s mission to provide seamless care will take its next step with the deployment of a patient portal. “Patients will be able to access lab results, radiology reports, and appointment schedules and communicate with physicians from home. Although our area is rural and many of our patients are elderly, demand is increasing for online communication,” says McColm. The power of IT and the Internet to turn the world into a “global village” not only works globally but also closer to home, whether the goal is to bring care to dispersed rural communities or to an urban organization’s continuum of care. In the sparsely populated plains of northern Iowa, seven hospitals that are part of Mercy Medical Center — North Iowa, Mason City are fortunate to be backed by the resources of Trinity Health. This year, all seven installed an integrated EHR system that transformed the way care is delivered in this rural area. The implementation is part of Genesis, a systemwide initiative uniting state-of-the-art clinical information systems with evidence-based knowledge to ensure patient safety, clinical quality, and financial performance. Although the Genesis model is ideal for uniting communities in areas such as northern Iowa, when complete it will integrate computer systems far beyond a set of rural communities to 24 community hospitals in seven states. • Adverse drug event alert system: Orders are automatically cross-checked with a database to help physicians and pharmacists recognize potential drug interactions on the model of a fully electronic, closed-loop medication cycle. For every provider that touches the process, the computer issues alerts, reminders, and constraints to ensure that the patient gets the right drug at the right time in the right dose. This applies to the ordering phase (the physician), the verification phase (the pharmacist), and the administration phase (the nurse). Since 2003, about 50,000 alerts across all Trinity Health facilities have resulted in orders being changed by a physician. • Supply chain management system: A common catalog and manner of procuring the equipment needed for care is used across all of Trinity Health. Trinity Health’s consolidation of all facilities into a single database and a single architecture not only reduces complexity but also ensures that data are protected in the event of system failures and power outages. “For instance, if the system goes down and Novi, Mich., is cut off, we can ‘fail over’ to another location in another city,” Kramer explains. In addition, the system regularly exports the EMR to battery backed-up devices at every facility so that medication lists and current orders and documentation can be re-created immediately after a system failure or power outage. Smaller hospitals and healthcare organizations that do not have the resources of a large parent company have also made progress in closing the gap between providers and dispersed rural communities—with and without grant support. David Collins, MHA, CPHQ, CPHIMS, HIMSS’ director of healthcare information systems who manages the Davies awards and goes on site to facilities around the country, continues to be amazed by the ingenuity and sophistication of rural healthcare organizations. This capability saves lives because unstable patients need no longer be transported to other clinics. However, when transport does become necessary, the surgeons can consult with the air transport unit while records are being forwarded electronically, so everything is ready at the receiving facility as soon as the patient arrives. The hospital has also implemented telemedicine for its three pediatric intensive care units (ICUs). Video equipment lets physicians consult with affiliated or nonaffiliated hospitals throughout the state. Patients even have video equipment set up at their homes for anytime consultations. In addition, Eastern Maine is piloting a virtual ICU that will permit nurses to remotely monitor a patient’s status and speak with him or her. The ICU’s camera is so sophisticated that it can zoom in on a patient’s wrist band and read the name and medical record number, acting as a verification tool for medications or blood transfusions to a floor nurse. Eastern Maine plans to expand the virtual ICU model to provide remote services to outlying hospitals. In Augusta, Ark., White River Rural Health Center has partnered with the U.S. Department of Agriculture, Rural Development Division, Distance Learning and Telemedicine Office. A grant of $341,297 was the starting capital behind the creation of an EHR for the center’s widely dispersed rural constituency. The clinic’s Web portal allows physicians to reach into the record during off hours for medical authorizations, lab orders, and prescriptions and facilitates the continuity of care during hospital admissions and on-call emergencies. Patients can access their medical records through the portal and get involved with their care. Some organizations prefer not to use grants. In Washington state’s Columbia basin, the town of Othello has a population of around 6,000, but its health center serves 30,000 patients from surrounding rural areas, including migrant seasonal farm workers. “Columbia Basin Health Association has a phenomenal EHR system and provides top-rated care,” says Collins. “It also has about 12 clinical minivans that provide care to rural sites. The organization had no choice but to implement cutting-edge technologies because it could not serve its population otherwise.” The clinic forgoes grants to rely on ingenuity, drive, and economies of scale. Just as in Othello, necessity was the mother of invention for Cherokee Indian Hospital Authority and other smaller organizations. While some rural hospitals may still be behind the times, many others have found the financial resources and taken the lead with advanced technologies to bridge the gap between patient and provider.